Retransfer ID Card Printers and Encoders�the FARGO� HDP5000 and HDP5600�are built on the industry-leading, fifth-generation HDP platform. The Fargo HDP5000 and HDP6500 ID Card Printers are for enterprises that need to issue high-resolution and secure badges in a cost-effective way in high volumes. Reverse-transfer technology offers increased capacity and unmatched, vibrant, over-the-edge print quality. 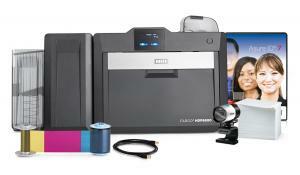 A versatile modular design and unique field-upgradeable features make these printers highly adaptable to your needs. The HDP5600 is conveniently available in either 300 dpi or 600 dpi to meet your unique card-printing needs. WHAT ARE THE KEY SPECIFICATIONS FOR RETRANSFER ID CARD PRINTERS LIKE THE FARGO HDP5000 AND HDP5600? The Fargo HDP5000 AND HDP5600 Retransfer ID Card Printers fulfill enterprise needs to issue high-resolution and secure badges in a cost-effective way in high volumes. They offer increased capacity and the best print quality. 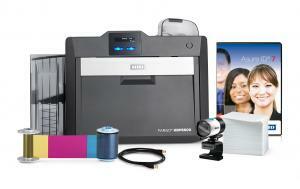 Affordable, high resolution 600 or 300 dpi printing option for superior text and image quality. HDP� Color Dye-Sublimation / Resin Thermal Transfer printing and rewritable technology for premium print quality. An anti-fraud customized security watermark can be printed across the card surface. Easy-to-load high-capacity ribbons, films and laminates; replaceable card-cleaning roller (included with each print ribbon). 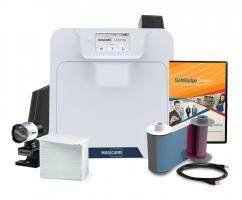 Fastest card printer on the market with 150 full color cards per hour (YMC with transfer). User-friendly, SmartScreen� LCD control panel / display with easy-to-follow prompts for instant printer status. Includes FARGO Workbench diagnostic utility tool with Color Assist spot-color matching to simplify printer maintenance. 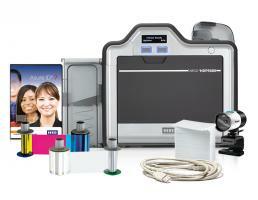 The HDP5000 and HDP5600 retransfer ID printers are backed by the best warranty in the industry. The fully comprehensive three-year package includes no-quibble printhead lifetime warranty and a loaner service. 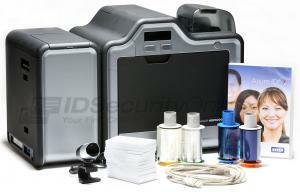 CAN I STORE DATA ON MY ID CARDS WITH A FARGO HDP5000 or HDP 5600 RETRANSFER ID CARD PRINTER? Several options are available to convert your Fargo HDP5000 or HDP 5600 Retransfer ID Card Printers into powerful encoding machines. The easiest � and most inexpensive � way to add data is through barcodes. No need for a specific encoder: all you need to do is add a barcode in the design of your cards through your software. If you need to print and encode cards with a magnetic stripe, choose a Fargo HDP5000 or HDP5600 Retransfer ID Card Printer with a magnetic encoder. Widely used in access control and time and attendance, magnetic cards are an affordable choice for your badges. 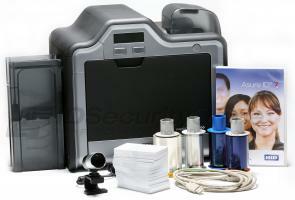 If you need more secure badges, opt for a Fargo HDP5000 or HDP5600 Retransfer ID Card Printer with smart card encoder. With contact and contactless smart cards, the data is securely encoded into an embedded chip. To store data and to be read, a contact smart card must be inserted into a reader, while contactless smart cards only need to be waved within range of a reader. Perfect for student IDs, healthcare cards, loyalty cards or government IDs, smart cards can now easily be created with a Fargo HDP5000 or HDP5600 Retransfer ID Card Printerwith smart-card encoder. 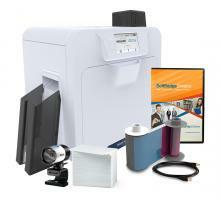 WHICH TYPES OF LAMINATES DO THE FARGO HDP5000 AND HDP5600 RETRANSFER ID CARD PRINTERS OFFER? The Fargo HDP5000 and HDP5600 Retransfer ID Card Printers are available with a single or dual-sided lamination module to add an extra layer of protection to your printed cards. Clear laminates: a clear protective layer of 0.6 or 1.0 mil is applied to your printed cards. Laminates can be patches or overlay. Patch laminates leave an unprotected border around the edge of your cards while overlay laminates cover the entire surface of your cards. 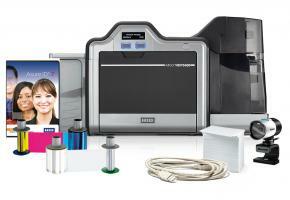 WHICH OPTIONS CAN I ADD TO UPGRADE MY FARGO HDP5000 AND HDP5600 RETRANSFER ID CARD PRINTERS? Single or dual-sided card lamination modules: apply overlaminates to your cards to increase card durability and reduce the risk of counterfeiting and tampering. The Fargo HDP5000 and HDP5600 Retransfer ID Card Printers can laminate both sides of your cards simultaneously for maximum efficiency.